Varec is a leading provider of end-to-end aviation fuel management solutions from tank farm to take off. 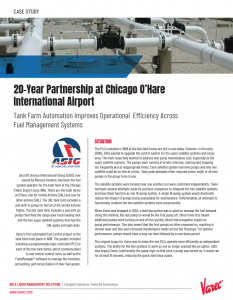 The world’s busiest airports have leveraged our products and services to help improve logistics and operational efficiencies across key aviation fuels management areas for over 20 years. These areas include tank farm automation, into-plane fuels automation, fuel inventory accounting, dispatch, GSE data capture, and enterprise systems. 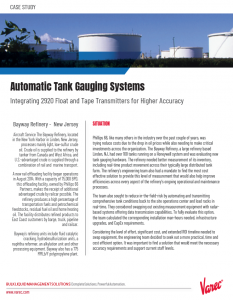 Our aviation fuel management solution includes tank farm automation that leverages a full line of level measurement and field instruments, as well as exceptional engineering for better control and hydrant pump performance. 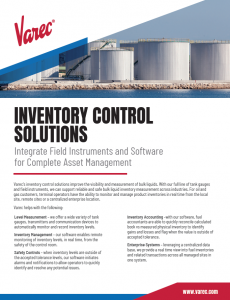 With the FuelsManager® Inventory Management, SCADA and Load Rack Automation applications, facility operators gain a real-time movement tracking system that can automatically track fuel movements based on valve position, pump status or user command. Operators can easily view which tank received or issued fuel and how much was moved. Further, fuel owners gain real-time insight into their fuel levels and account balances. We offer engineering services that integrate PLCs to field instruments for pump and valve control, flow monitoring, and movement and alarm tracking. The additional control also improves pump performance and helps reduce maintenance costs. 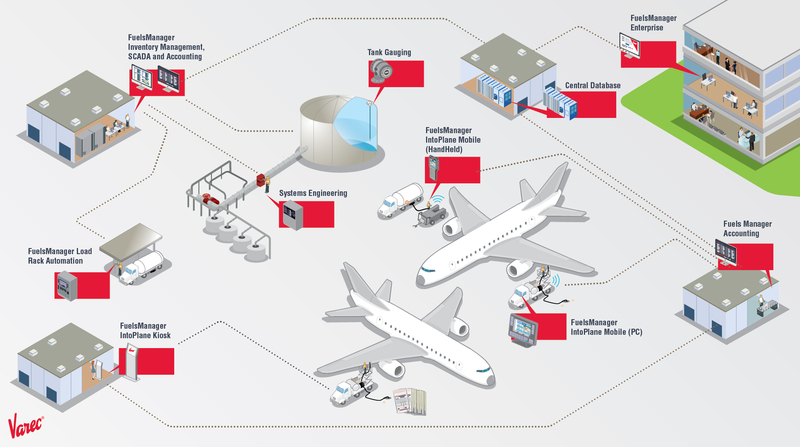 We help streamline the aircraft fueling process through real-time automation or validated data entry that helps reduce errors and delays, and improves accuracy. 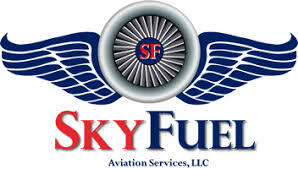 With multiple interfaces available for integration with our FuelsManager IntoPlane application, fuel agents are able to work more efficiently through guided into-plane data collection and entry at the wing tip, eliminating the common errors found when using paper tickets to manually record fuel transactions. This automated solution replaces back office data entry as key flight and fuel load information is provided in real-time for more accurate dispatching, while also capturing load data to automatically perform net volume calculations and validations. When real-time data collection at the wingtip is not available, fuel agents can use a touchscreen kiosk or desktop computer for rapid data entry and validation of their manually recorded fuel transactions. By integrating tank farm systems with the FuelsManager Accounting application, facility operators can streamline the inventory accounting and reconciliation process as these applications support all aspects of aviation fuels management. Fuel accountants and managers have a tool to simplify the process and provide an accurate overview of fuel ownership. They receive meter reconciliation and daily close out data with a full audit trail and transaction reporting each day, and can easily compare accurate fueling transactions (book) and inventory stocks (physical) to identify gains and losses, as well as the ability to track and filter by receipts, issues, defuels or reloads in order to track book inventory movements, such as transfers and adjustments. In addition, they have access to an efficient, accurate and secure method of ExSTARS reporting on a monthly basis. This automation is a more efficient process that gives fuel accountants the time to adequately focus on ensuring any gains or losses outside of tolerances are investigated and better managed. Dispatch agents at airports often have to manually compile data, such as flight schedules and load planning, from multiple sources in order to create a daily fueling schedule. When paper tickets are used, and there are changes to any fueling information, agents have to quickly communicate those updates via radio communications to try and avoid flight delays. The FuelsManager Dispatch application serves as an automated resource management and planning tool. It automatically compiles and displays fueling information, supports automated or manual fuel requests via handheld computers and provides a single overview of all fueling activity and status in real time. Critical data such as pre-loaded flight schedules and data from FIDS and airline load planning systems are imported. The Dispatch application also integrates with IntoPlane handheld computers to further expedite and streamline the fueling process. Gain insight and accountability into how much fuel has been distributed to ground support equipment to ensure accurate accounting and invoicing. FuelsManager helps airport service providers automate and report on the fueling process for each individual piece of equipment. It also prevents the issue of the wrong fuel type and ensure only those vehicles authorized, receive fuel. This level of automation, using handheld computers, helps reduce the issues associated with paper tickets, such as manual data collection, calculation errors, hard to read hand writing, missing tickets and improves the accuracy of accounting and reporting. The handheld identifies the vehicle, verifies the product to be issued, captures meter values and records the fuel volumes issued, in real-time or in an offline batch mode. This data is used to provide improved oversight of trends, fuel use and reduce the potential for fuel losses. With FuelsManager Enterprise, our customers are able to access their fuel inventories and related transactions across all managed sites in one system. Users at the airport are provided real-time information and status updates, while remote users are able to access corporate-wide overviews and operational data across all managed sites. Automated reporting services, integration with Microsoft® Office and the ability to export data are all supported features. FuelsManager can also be integrated with corporate ERP systems and third-party business partners such as SAP. As an added benefit, all airline flight schedules and fuel loads are transferred in a single data stream, with little to no airline IT effort after the initial data feed has been established. An enterprise system also helps reduce IT capital expenditures as no local software needs to be installed, nor are there databases or servers to manage and maintain. Contact Jet-A, Inc. – Varec’s global sales representative for aviation fuels management systems.